Killer Characters: Pet Rescue... Yes! Today I want to tell you a bit more about NKLA, which means “No Kill Los Angeles.” My friend Dr. Carlie Stellan, a wonderful veterinarian, blogged about NKLA here a few months ago. 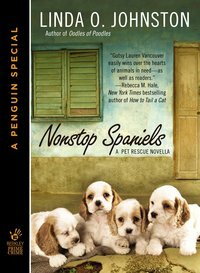 That was partly because NLKA is featured in a novella about me called NONSTOP SPANIELS, which is available in e-format. I’m an advocate of NKLA, which is an initiative of Best Friends Animal Society that consists of a coalition of pet rescue organizations. The reason I’m mentioning NKLA and NONSTOP SPANIELS again? Because Best Friends already had one shelter open in Los Angeles and it just opened another, a new, high-tech pet adoption shelter in West L.A. More animals will be saved! Those of you who know me understand that I don’t particularly like to brag--but I’ll do anything to champion pet rescue. Yes, I’d like to be the one who helps to save them all, but I’m always happy to hear about new avenues for rescues. I suggest that you read NONSTOP SPANIELS, not only to learn about my own wonderful no-kill pet shelter HotRescues, but also to learn more about NKLA. Oh, and yes, there is a murder mystery in NONSTOP SPANIELS that I wind up having to solve, but these days I do a lot of that. I need to check this out! I LOVE Best Friends!! They are an amazing group!! I agree, Julie, even though we're somewhat in competition. And so does the chronicler of my adventures, Linda O. Johnston.